Tucked in a picturesque alpine basin at the foot of June Mountain, Angler’s can’t resist the call of June Lake’s bountiful waters. And at just twenty miles north of Mammoth Lakes, they don’t have to. Trout season opens the last Saturday in April and runs through November 15th. Troll the lakes deep sections for Rainbow Trout. The public beaches provide ideal shore fishing. Located on the June Lakes Loop (from Mammoth head north on 395 and exit on California State Route 158), June is an alpine lake situated at an elevation of 7,621 ft. At a length of 1 mile, a width of just over half a mile, and an average depth of 60 ft, the lake packs plenty of fishable waters. At June, trout fishing is the name of the game. Expect to hook Cutthroats, Rainbow, and Brook trout. Brown Trout make an occasional appearance. Trout fishing season opens the last Saturday in April and runs through November 15th. June offers opportunities for both fly and spin fishing. Those fishing from a boat can launch from either of June’s two marina’s, where they also provide rentals and sell equipment. Boats larger than 24 ft long are not permitted to dock on June Lake. Those without a boat can cast their lines from shore, or make use of alternative vessels such as float tubes, kayaks, pontoons, fishing cruisers, barges, or paddleboats. Along with the Lakes Diverse Terrain - ranging from deep water, to shallow beaches and thick reed beds - come multitudes of rigging options. Hire a qualified guide to get advice on the best gear and locations. For shore fishing, the public beaches are ideal; just make sure to arrive early to beat the swimmers. Tule Bed’s make an excellent spot for fly fishing. This year Dan Blanco landed a 15 lb. 10 oz. German Brown among the reeds. For slow trolling, the lakes deeper waters have been providing reliable strikes from Rainbow Trout. 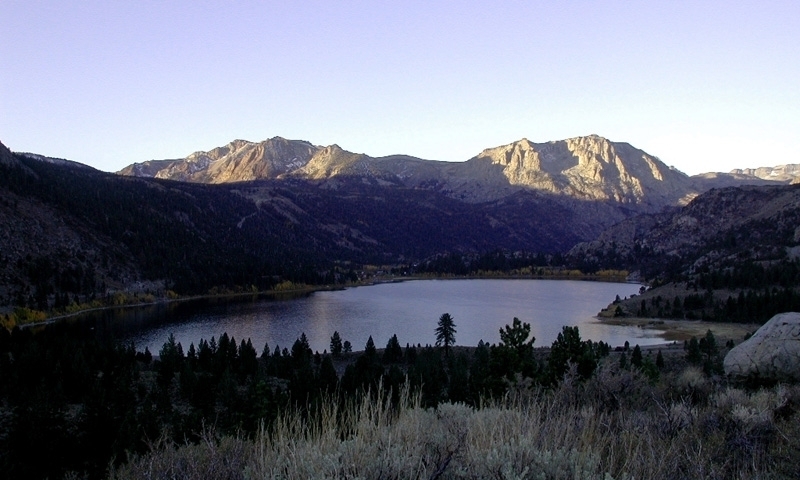 When first approaching the June Lake from State Route 158, the rocky embankments make ideal launch points for float tubes. Boat and gear rentals are available from the Lake marinas and shops in town. With the diversity of species and terrains at June, the possibilities for bait and tackle set-ups are endless; a guide service eliminates the guesswork and provides valuable area knowledge.